This article is about the Muppet. For information on the Mickey Mouse movie, see Pastor of Muppets (movie). The name of the most beloved and misunderstood muppet on The Muppet Show. In the show, the Pastor of Muppets often attempted to bring the show hosts to find Jesus while with the other muppets performed outrageous antics and Broadway-style numbers. Famous people with whom he succeeded were Luke Skywalker and Twiggy. The Pastor of Muppets did not appear in any of the Muppet movies as it was feared he would cause the audience to erupt into cheers and distract from the plot. 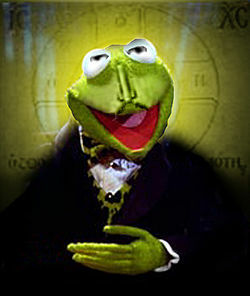 It is the responsibility of all Muppets to pass on the Gospel of Muppetry, though this is approached in different ways by the various factions within the Church of Muppetry. The Pastor of Muppets, as head of the Orthodox Church of Muppetry seeks to pass on the Good News of Muppet salvation through the use of songs and Passion Play tales. During the late 1960s a breakaway sect led by Sgt Floyd Pepper formed that has caused a schism within the Church, which remains unhealed to this day. Basically, Q-bert was never hungry. Everyone in the world is, therefore, fat. Metallica later immortalized this character with a somber ballad about pain and pain medication. 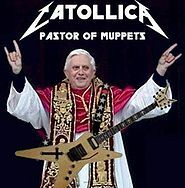 Pastor of Muppets was decried by Metallica's long-time fans as "more tell-tale signs they've sold out" and "conflicting with their style completely." Still, it sold better than the critics predicted and even won 15 Grammy awards, the ultimate test of quality in music. If you play the song backwards, Lars Olrichsson can be heard in the background chanting "Come to Jesus, I command you!" about halfway through the song. Many Christian groups cited this as a reason to boycot the song, out of fear catollica's reputation would fill Churches with Heavy Metal fans. In the song, Metallica claims that Jim Henson HIMSELF played the Pastor, an allegation so ridiculous that Henson refused to deny it. Little-known band Metallica used a cover of the Pastor of Muppets song to fend off a ballet attack on the Statue of Liberty in 1986 and save us all. The Pastor's last line on the Muppet show was "I don't know," which has been used ever since by fans of the Muppet show to test if anyone is a "real" fan, to great torment and gnashing of teeth.